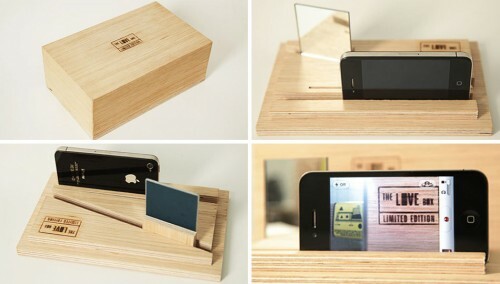 Film Both Sides Of The Action With This Simple Wooden Box | OhGizmo! There may be occasions where you want to see what’s going on on both sides of the iPhone 4/4S’s camera. Say you’re filming a dialogue. One way you can accomplish this is with a simple device like the one you see above. Some plywood, strategic grooves, and a mirror and suddenly you have “the world’s first handmade video mixer.” This is about as low-tech a solution as you can get, though the result is elegant if not professional looking. Sadly, the asking price is $90 for something that really looks like it could have been made in shop class. There’s some kind of attempt at justifying the it, what with it being a limited edition of 100 units and also the fact that it was “Conceived in Paris whilst recording a documentary about love and love after love.” So yeah, cute little product there. $90. * Pardon me while I vomit, a little.